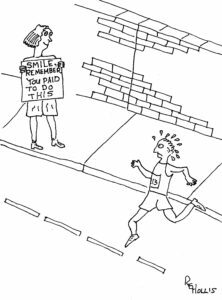 With apologies to William Shakespeare, “To race or not to race, that is the question” is one that every runner, especially beginners, asks themselves. Unless you are a professional (which leaves out the other 99.9% of us), who race to win and make money, then you have to decide. Are you concerned that you don’t run fast enough and people will make fun of you? Don’t worry, nobody is watching, they could care less. It’s not as if the paparazzi are going to be filming you for the evening news. Everyone else is more concerned about their own issues than how fast you are running. Besides, you’re faster than the couch potato at home eating from a plate of nachos. You’re not going to place in the top three of your age bracket and won’t get an award! Big deal, what are you missing? Another beer mug to go with the other dozen on the shelf? a chintzy medal? another hat? It’s not like you’ll win the lottery. Anyway, there’s always next time. You don’t have the right clothes to wear! There is nothing that you plan to wear that hasn’t already be seen. There are races for runners wearing no clothes (except for shoes, pretty easy to pick out an outfit), runners with Thanksgiving, Christmas, St Patrick’s Day, Easter holiday attire and runners in hot dog attire, animal attire and just about any other attire they can think up (including tu tu’s). So be bold, the worst thing that can happen is that someone gets a chuckle out of it. What if someone passes me! Big deal, get over it, they probably went out too fast anyway and you’ll have the last laugh when you pass them 50 yards from the finish line. Revenge is sweet. (Just don’t rub it in, they may remember you next time). So there you go. Now you don’t have any reason not to sign up for the next race. And, once you’ve completed that first one, you’ll be committed. On top of that, now you can brag to all of your non-running friends and what can be better than that?